Description: Between 1803 and 1806, Meriwether Lewis and William Clark co-captained the most famous expedition in American history. But while Lewis ended his life just three years later, Clark, as the highest-ranking Federal official in the West, spent three decades overseeing its consequences: Indian removal and the destruction of Native America. In a rare combination of storytelling and scholarship, best-selling author Landon Y. Jones presents for the first time Clark's remarkable life and influential career in their full complexity. Like every colonial family living on Virginia's violent frontier, the Clarks killed Indians and acquired land; acting on behalf of the United States, William would prove successful at both. Clark's life was spent fighting in America's fifty-year running war with the Indians (and their European allies) over the Western borderlands. The struggle began with his famed brother George Roger's western campaigns during the American Revolution, continued through the vicious battles of the War of 1812, and ended with the Black Hawk War in the 1830s. In vividly depicting Clark's life, Jones memorably captures not only the dark and bloody ground of America's early West, but also the qualities of character and courage that made him an unequalled leader in America's grander enterprise: the shaping of the West. No one played a larger part in that accomplishment than William Clark. 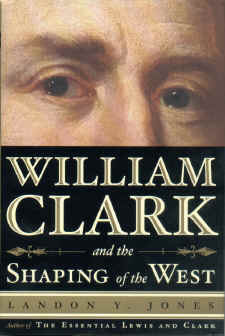 William Clark and the Shaping of the West is an unforgettable human story that encompasses in a single life the sweep of American history from colonial Virginia to the conquest of the West.